Both are equally exciting opportunities, of course – but only one of them is real. So, maybe let’s talk about that one? 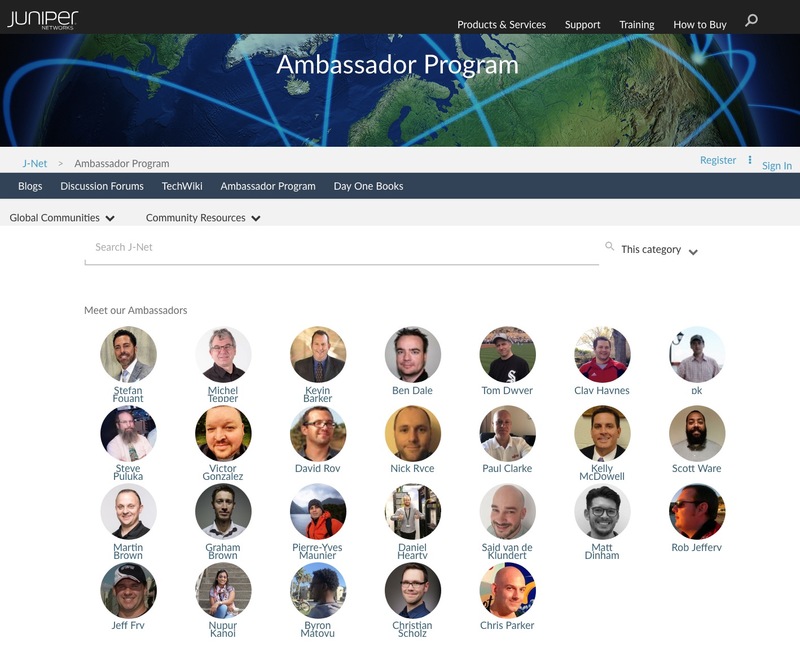 The Juniper Ambassador Program was, until yesterday, a group of 25 brilliant network engineers around the globe, united by a passion for, and expertise in, Juniper’s product set and technologies. But now, it’s all changed: as of today, it is instead a group of 25 brilliant network engineers, plus me. 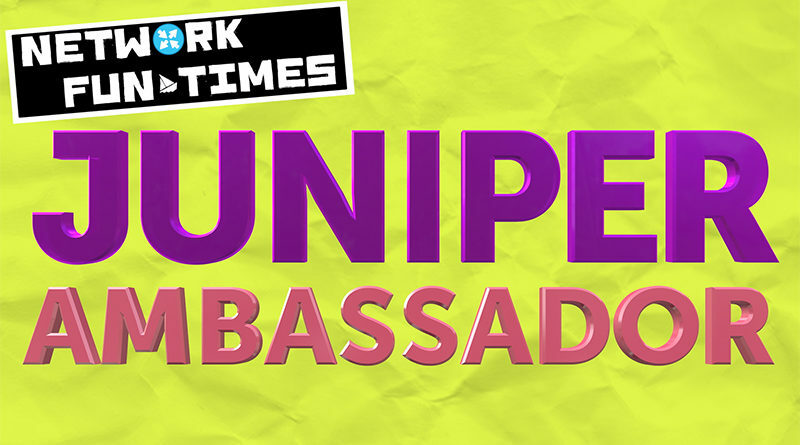 So, what is a Juniper Ambassador? Essentially, they’re people who go above and beyond to get involved in the community, to spread knowledge about how Juniper’s products actually work, to help educate and give support to colleagues worldwide in learning the inner-workings of Junos, and all the protocols that hold our beloved internetworks together – as well as the latest developments in SDN, the power of Juniper’s automation offerings, and plenty more. In particular, we’re actively expected to stay honest – in other words, we’re not paid shills, blindly saying everything Juniper does is perfect. Instead, we’re simply folks who regularly evangelise on social media, in blogs, on the forums, and indeed in real life (that’s right, dorks – real life!! 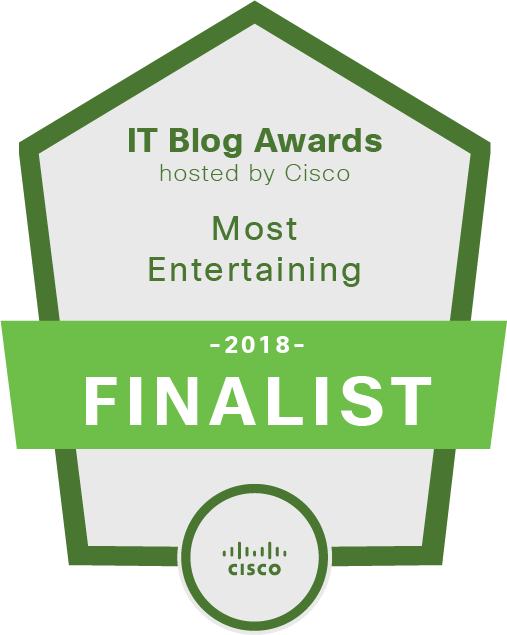 Customer meetings, presentations, and plenty more behind-the-scenes stuff) about Junos and the Juniper way of thinking – and we do it because we sincerely think that Juniper technologies are among the best of the best. We do all of this not for money, but for love. …well, and for free merch. …and cocktails. But mostly for love. We get access to new Juniper news and developments early, so you can expect me to be sharing (with permission of course!) some exciting new upcoming tech. We get invited to write books for Juniper, and to contribute chapters to the annual Ambassadors Cookbook. We also get direct access to some “Senior Nerds” at Juniper HQ who we can refer to when we have our own technical questions – which gives us the ability to then pass that knowledge along to our fellow engineers in the industry. Hey there: I’m talking about you! I think it’s fantastic that Juniper has a program like this. I’ve been blogging my Juniper knowledge for a while now, and I did it with no expectation of any gain, apart from making some new friends online. It would have been easy for Juniper to pay no attention to it at all. Indeed, I would have thought nothing of it if they had ignored it. They’re a huge company, and I’m one guy. So the fact that they actively try to bring people like me on board, shows to me a heartening commitment from Juniper to nurturing the community. There’s a blog post on the Juniper forums welcoming me to the team, with a little interview with me. You can read it, if you like? WHAT WILL I BRING TO THE AMBASSADORS TABLE? I’m truly honoured to have been invited to become a Juniper Ambassador. It’s a dream, and I can’t tell you how excited I am to have joined the gang. In terms of technical expertise, I’m clearly the baby of the group. I’m only a JNCIP, whereas most of my fellow Ambassadors have at least one of Juniper’s Expert certs – and indeed, many of them have multiple JNCIEs. Multiple! Most days I can barely even remember where I put my keys. In the fruit bowl? In the bin? It’s anyone’s guess, it really is. But that’s okay, because I like to think I can bring a different skill to the table: my old career as a comedian taught me a lot about how to communicate complicated ideas concisely, in an engaging way; to explain difficult technical concepts even to non-technical people, in a way that is fun and interesting, and in a way that they actually understand. I think all of us in this industry can think back to a training session, or video tutorial, that made us want to fall fast asleep, and never wake up. There’s a lot of it around, and the trainers mean no harm by it, but the fact is, being well-versed in a technology doesn’t necessarily mean that you can teach that technology, let alone teach it in a way that will inspire people. That’s why my aim is very much to inspire people to be as enthusiastic and electrified (not literally – stay safe, friends) about networking, and Juniper, as I am. And as an Ambassador, I fully plan to take that aim to the next level. I’ll carry on sharing my knowledge, especially on my own personal quest, whether my next step is the JNCIE-SP, JNCIP-ENT, or JNCIS-SEC. I want them all, and I’ll make sure to bring you along on the journey with me. The second is handsome viking Stefan Fouant, not only for being instrumental in bringing me on board, but for being a huge inspiration to me over the past 12 months. Stefan is the embodiment of the kind of engineer whose passion is infectious, and the industry is very lucky to have him. It’s a privilege to be alongside him. And finally, of course, the biggest thanks of all has to go to Julie Wider, the hero that runs the Ambassador program, and the J-Net Community at large. None of this would have happened without her, even the community itself. I’m sure engineers would still find a way to share knowledge, but no way would it be the same, not nearly as big or connected. Julie expertly runs and maintains the very fabric that brings us all together, and we owe her a great deal. If this is your first time hearing about me, I’d love you to have a read through some of my other posts. I hope you’ll enjoy them, and learn some new cool stuff along the way. And if you like what you read, follow me on Twitter to find out when I make new posts. If you don’t like my tweets, I promise you, I’ll give you your money back.